Slow-foodies have touted the virtues of eating local for years, but wearing local? Rebecca Burgess of Marin County, CA, knows it can be done. Since last spring, the educator and textile artist has worn only clothes spun, dyed, and knitted within 150 miles of her front door, otherwise known as her "fibershed." With her yearlong project coming to a close, Burgess is parlaying her knowledge into an online storefront, aptly dubbed the Fibershed Marketplace, that features goods from her local supply chain. “We have off-shored the effects of our consumption, which has led to a great disconnect the costs of our clothing,” says Burgess. 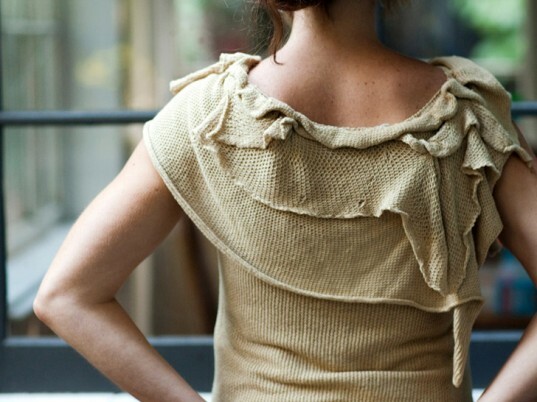 Although it started out as an experiment, Fibershed has evolved into a model for sustainable garment production. Burgess plans to drum up support for her fibershed network first by building a cotton mill on Foxfibre’s organic farm in the Capay Valley, then by buying industrialized weaving equipment and knitting frames for Bay Area designers to work with local fibers. Although it started out as an experiment, Fibershed has evolved into a model for sustainable garment production. With the help of with photographer Paige Green, Burgess distilled her experience into a book, Harvesting Color: How to Find Plants and Make Natural Dyes. Each section includes a knitting project using wools colored with seasonal plants. Her book, like the project that preceded it, extolls a “bioregional wardrobe” that not only “speaks the language of the landscape” but also provides a template for communities everywhere to adopt and adapt. Designed by Heidi Iverson, the Fibershed wardrobe consists of eight primary pieces, along with several accessories (such as the leg-warmers above). Most of the garments were made last June, starting with one shirt and a single pair of pants. "I wore them for three weeks," Burgess says. "There were some interesting sensory moments when the clothes were being washed, realizing that without those garments, there was just me and my skin." For summer, Burgess used color-grown organic cotton from Foxfibre in the Capay Valley. In the chillier months, she stayed cozy with alpaca from Julie Anderson for Renaissance Ridge outside Sacramento and merino from Jean Near in Mendocino. One of the pieces is a tunic made from the wool of a sheep named Saturday, who lives on the homestead of Kenny Kirkland in Tennessee Valley. Local artist Nance Ottenstein dyed it in the summer using fall-harvested black walnut, Japanese indigo, coyote brush, and eucalyptus. "This garment is a living symbol of what can be created when we focus on what is here and what is now," Burgess says. Designer Mali Mrozinski, who sewed a black felted alpaca coat for the project, meets the herd that supplied the fiber. 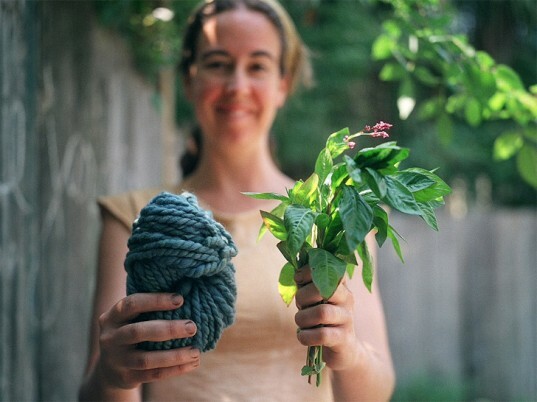 Indigo-dyed yarn, posing with the plant responsible for its deep blue hue. At Yolo Wool Mill in Woodland, CA, the single small but well-maintained mill in Burgess's fibershed community. Although it opened only in 1991, the mill uses 90-year-old equipment from companies that no longer exist. "Aall the replacement parts need to be recreated," says Jane Dreamer, who runs the mill with six employees. "The guys in the local welding shop say, ‘Oh boy, here comes Jane,’ because I’m always needing some crazy part fabricated." Saying hello to sheep at Woolly Egg Ranch in Mill Valley. A shirt, wrapped in kelp to "resist" the dye, being pulled out of a dye vat on a seaside dyeing excursion. Yarn and fabric swatches dry out on a makeshift rack of driftwood after seawater was used as a mordant. A field of organic, color-grown cotton that needs no dyeing. An example of a bioregional wardrobe.